As children, it was drilled into our heads to never get into a car with a stranger. Now, it's something we do with little hesitation. We rarely think twice when using an app for a complete stranger to give us a ride to the airport or a ride home after a fun night out. With headlines like, “103 Uber drivers accused of sexual assault or abuse” and “Young woman claims she was sexually assaulted by Lyft driver in Toledo,” one can see why ride-hailing apps and women's safety are often scrutinized. Hailing an Uber or Lyft is like playing a game of ride-hailing Russian roulette. Instead of a say in who pulls up, one gets is the driver's first name, a small picture, their rating, the make of the car, and where they're located. And while the driver's small oval photo may not seem like something that would make one feel safer, for nearly half of women, it does. So what else does it take for women to feel safe getting into an Uber or a Lyft? To find out, we surveyed women across the country about those ride-hailing companies. We wanted to know about women's experiences - good and bad - while taking a ride in someone else's car. We also asked if safety was a factor in their decision to use Uber or Lyft and if they took any precautions. The most overwhelming response out of all of the questions came down to one key factor, the driver's gender. Recent reports show Uber has double the market share compared to Lyft, so it wasn't surprising when 82 percent of the women surveyed said they use Uber more than its main competitor. 79 percent said safety is a factor in deciding between the two. But when it comes to the person behind the wheel, women riders want women drivers. Nearly 45 percent prefer female drivers. Only nine percent want male drivers and 46 percent have no preference. Another reason could be female drivers are far less likely to engage in risky driving behavior, according to the Insurance Institute for Highway Safety. One can understand why women prefer female drivers when looking at the data of what they're facing when they get into the car. 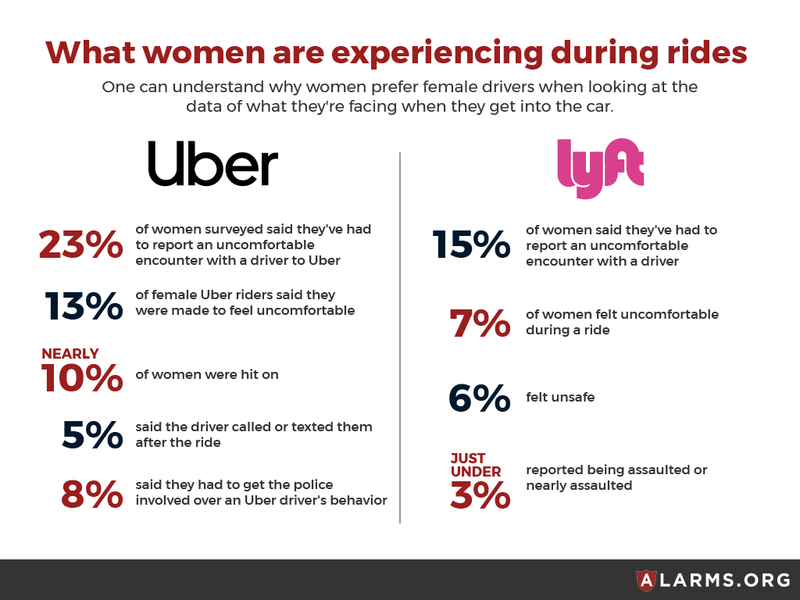 23 percent of women surveyed said they've had to report an uncomfortable encounter with a driver to Uber while 15 percent of women said the same thing about Lyft. Situations sometimes escalated. Eight percent said they had to get the police involved over an Uber driver's behavior. A similar statistic for Lyft is just under eight percent. 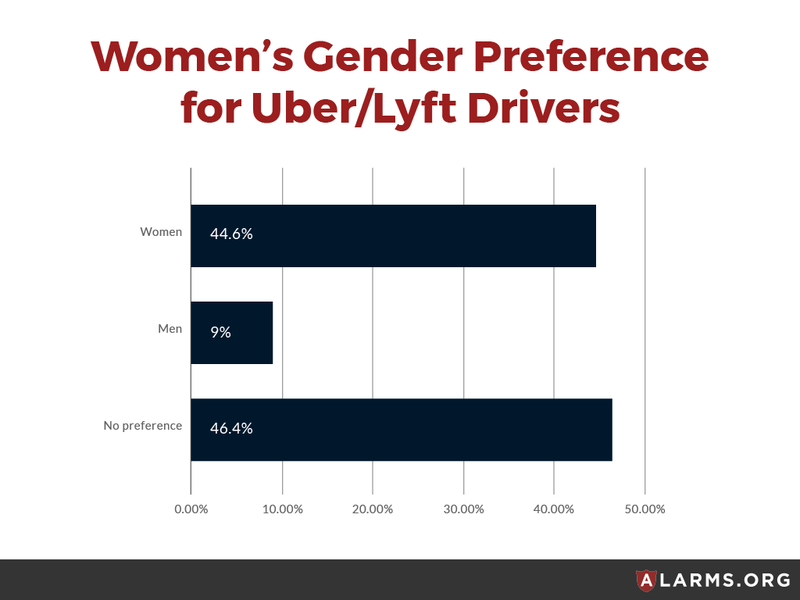 We broke the data down even further, looking at what women are experiencing inside an Uber or Lyft. They reported everything from getting hit on to the driver contacting them after the ride. Nearly 13 percent of female Uber riders said they were made to feel uncomfortable, nearly 10 percent were hit on, and five percent said the driver called or texted them after the ride. A small percentage of women said they were assaulted or the driver attempted to assault them. Lyft had smaller percentages but is used less. Seven percent of women felt uncomfortable during a ride, six percent felt unsafe, and just under three percent report being assaulted or nearly assaulted. When asked about safety precautions, women told us the tactics they use. Some said they always tell a friend or family member they're taking an Uber or Lyft. Others only take rides if someone is joining them. Another precaution was scrutinizing the driver's profile and reviews. One woman carries a gun. Despite the numbers, women still trust ride-hailing apps. Our data shows they still consider Uber and Lyft the safest form of transportation compared to taxis, professional car services, and public transportation. More than 75 percent said they haven't used Uber any less due to safety. Nearly 67 percent for Lyft. Women's preference for female drivers is something both Uber and Lyft need to take into consideration. Neither Uber or Lyft have an option to request a driver based on gender. Uber has no plan to make it available although the company is on a crusade to recruit more female drivers. Uber is facing its fair share of legal wrangling over the danger women face while using their service. A class action lawsuit was filed in California claiming the company needs to do more to screen drivers and protect female passengers. Shortly after that, Uber announced it made a number of safety changes, including the ability to designate up to five contacts riders can share trip details within the app. It also made changes to its background checks, doing periodic reruns on drivers, not just in cities that require it. Lyft points out it has an extensive background check process, a one-million dollar liability insurance protection plan and a 24-hour critical response line customers can call and report any issues. While Uber and Lyft are opting out of allowing customers to choose their driver, some companies are catching on. Girl only ride-hailing businesses are slowly starting to pop up around the world. Carriage For Her is based in Malaysia, Sheba operates in Australia and Safr just launched in Boston, with plans to expand to other major U.S. cities. 500 women were surveyed across the United States for this report through online polling company Pollfish on October 23, 2018. Less than one percent said they never used Uber and 28 percent reported they never used Lyft. Of those who did use the apps, a majority reported they used them sporadically. Alarms.org is not affiliated with any of the ride-hailing companies mentioned in this report.